If you’re looking for a neighborhood that will give you the entertainment, shopping, and dining of Chicago, but offer you a tight-knit community rich in history and nature, then Long Grove is your destination. Whether you’re looking to buy your first family home or getting away from the city life, Helen Oliveri and The Helen Oliveri Team know exactly what Long Grove has to offer. The Helen Oliveri Team features the most unique and exceptional homes in the Long Grove area! The village now has very strict building ordinances to preserve its “country-town atmosphere”. 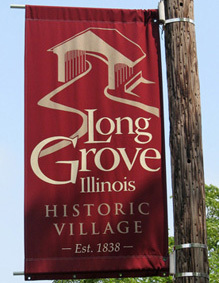 The Long Grove area is now known for its historic downtown, its exclusive million dollar homes and the annual chocolate, strawberry and apple festivals that take place in May, June and October, respectively.